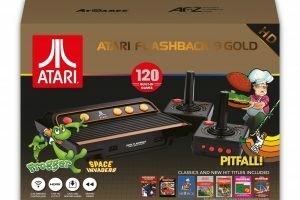 AtGames has released the Atari Flashback Portable, which is now available from a variety of major US retailers. While list price is $59.99, typical retail price is often quite a bit less. 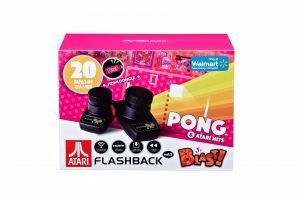 The Flashback Portable is part of the new AtGames Flashback Zone, which encompasses an increasing number of retro-themed products and a new social media presence on both Twitter and Facebook. The AtGames Flashback Zone is expected to be the AtGames retro gaming portal going forward and should hopefully see regular expansion. Other products for this year include: Atari Flashback 7, Sega Genesis Classic Game Console, Sega Genesis Ultimate Portable Game Player, and Atari Flashback Classics Volume 1 and Volume 2 for Sony’s PlayStation 4 and Microsoft’s Xbox One. In the box you get the handheld itself, a miniUSB cable for charging, and instructions. The handheld measures approximately 5.5 inches across, 2.5 inches high, and about three quarters of an inch deep. The box and its contents. Note that this is the limited pre-release review version, and the actual wide release version has a different built-in game list (e.g., no new Space Invaders port or Jungle Hunt). 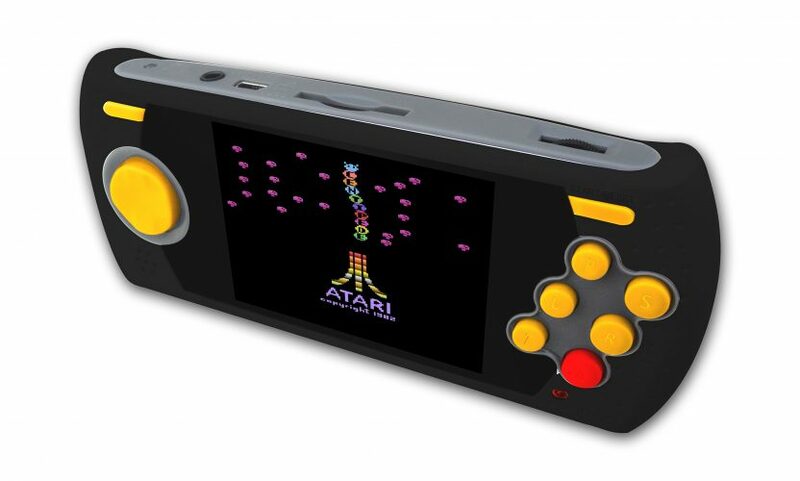 As expected, the Atari Flashback Portable is basically a handheld version of the Atari Flashback 7 console, just like the Sega Genesis Ultimate Portable Game Player is a handheld version of the Sega Genesis Classic Game Console. Although the Flashback Portable sports a newer generation of the hardware powering Flashback 7, there is no noticeable difference in the already excellent quality of the emulation. 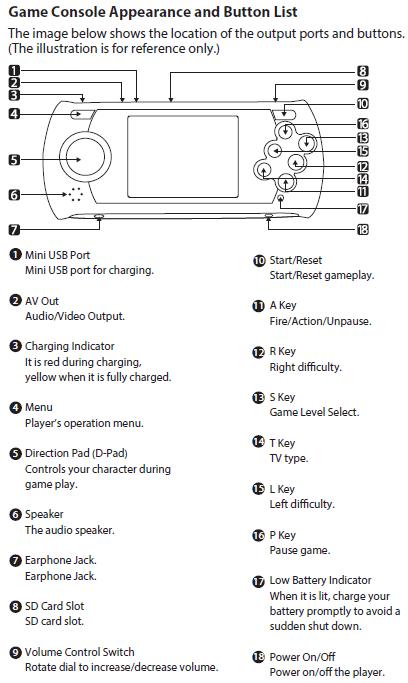 Page 1 from the manual, showing what each of the buttons and other hardware functions do. Unlike the Atari Flashback 7, there are enough buttons on the portable to replicate the original Atari 2600‘s six switches, as well as provide for extra features like returning to the Main Menu and pausing games. Naturally, the biggest difference between the portable and console is that the former sports an oft-requested SD card slot to play your own game ROMs. More on that later. In terms of the game selection menu (aka, Main Menu), a push to the left or right on the joystick moves to the previous or next page, respectively, while up and down moves amongst the games on the same page. 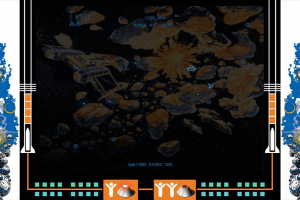 The primary action button (A) selects the highlighted game. Once a game is selected, the game is started the same way as on the original console, which usually means pressing Start/Reset or the A key (main fire button). Once in a game, you can select the usual difficulty (L, R) and game mode (S) options, as well as TV Type (T). An onscreen display lets you know when player 1 or player 2 difficulty switches are set to hard, although it’s unfortunate that it remains on the bottom of the screen outside of the play area once active. Since TV Type is an auto return switch type, pressing that button only displays Mono on the bottom of the screen outside of the play area momentarily. Although officially undocumented, a diagnostic menu option was publicly reported, so I’m able to repeat that useful info here. Hold down the three largest buttons (A, R, and S) when turning the unit ON and you’ll get a RAM, sound, and button check. This is useful if for some reason you suspect that something might be wrong with your unit, although most problems are usually related to a weak battery charge or not charging the unit long enough. You can see the full list of 60 games here (remember, my pre-production review unit and a limited number of early release units have a different list of 60 games). Basically, they’re a mix of first and third party titles, along with some homebrews (Frogger is a new port specific to the 2016 Flashback hardware). Although there is no hardware paddle option, the built-in emulator automatically lets you use the d-pad to play paddle games. Since this is a dedicated handheld, the unit only supports single player games that make use of the original console’s left joystick port. This means oddball games like Basketball or Wizard of Wor that make player one use the right joystick port don’t work the way they’re supposed to (look out for hacks that helpfully reverse the ports! (refer to this AtariAge thread on needed controller hacks for games)). Games that use special controllers, like Star Raiders or Cookie Monster Munch, also will not work without some type of hack (one exception, the one original Driving Controller game, Indy 500, works just fine via the portable’s d-pad). Everything else, including the aforementioned paddle-based games, has a chance of working. To add your own games, acquire an SD card that’s 8GB in size or smaller, and add your .BIN format ROMs to a root folder called Game. Most ROMs should appear without issue as long as they are in the correct format: the first initial should be a capital letter, followed by all lowercase letters. For example, Spaceinv.BIN will work, but SPACEINVADER.BIN will not. Of special note, AtariAge user thevnaguy has also posted his impressions of a similar pre-production model and AtariAge user Flojomo (working along with thevnaguy and others) has taken it upon himself to post a shared Atari Flashback Portable Compatibility List to keep track of what works and what doesn’t via SD card from the Atari 2600’s large original library (a growing number of hacks and homebrews are also being included on the spreadsheet). Although some notable games, like Berzerk and Galaxian don’t work without glitches (perhaps hacked versions will eventually appear that will work), and dozens more don’t work at all, many hundreds of titles work perfectly. Considering SD card support is a secondary feature outside of the 60 built-in games, that’s not too bad. The built-in LCD has good brightness and color (remember to remove the clear plastic shipping cover on the screen! ), and no motion blur. It does a good job of displaying the low resolution content. There’s a single speaker, but you can plug in headphones for added audio punch. There is also a composite AV connection, which allows you to connect to an external display with an optional cable, and is how I was able to capture the videos. When you plug in the cable, the internal screen goes off and the picture and sound are sent to the TV. As you would expect, the composite connection is just about the poorest connection available, but also arguably the most universally compatible, especially with the type of older CRT TVs the Atari 2600 games were originally intended for. It’s best to use the AV output of this portable with one of those older TVs as video quality will vary dramatically on modern displays, although is still generally usable. Of course, when using this on a modern display, you’ll want to make sure the games are shown in their original 4:3 format (like in the portable’s own native aspect ratio) rather than 16:9 (widescreen), although that’s more of a pet peeve of mine than a strict requirement. 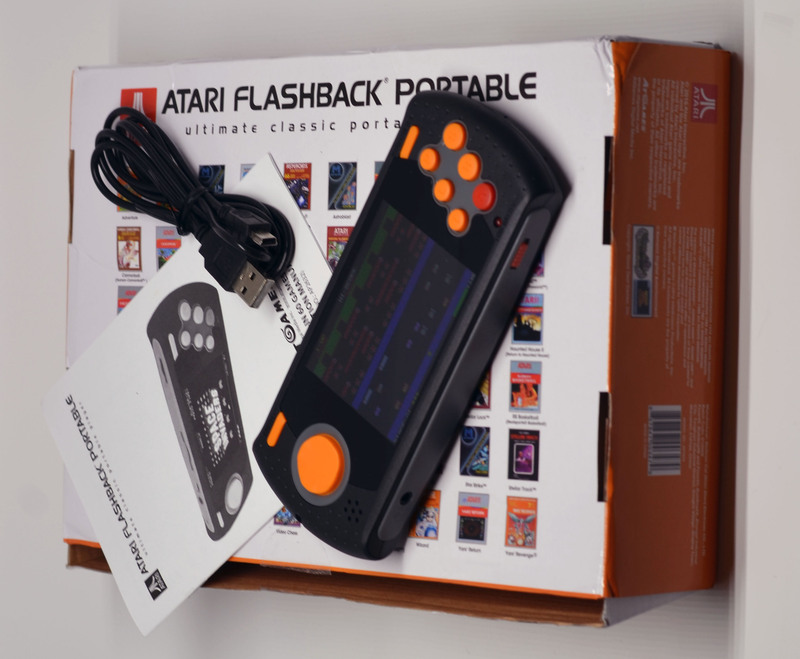 The Atari Flashback Portable is probably as close to perfect as AtGames has gotten with any of its hardware to date. It uses the proven handheld design from their long-lived Sega Genesis Ultimate Portable Game Player series and makes the tweaks necessary to give it a proper Atari 2600-centric identity. Hopefully for next year’s version we’ll see further improvements in the user interface and overall game compatibility from the SD card. For now, this year’s version fills a glaring hole in the AtGames hardware line-up and is well worth the relatively low price of entry. DISCLOSURE STATEMENT: I advise AtGames as an Independent Contractor. Of particular note in relation to this specific review, I provided design and feature guidance for the hardware, including button layout. I also provided design feedback and play testing for Frogger throughout its development. Opinions expressed in this review are solely my own, however, with no external consideration or approval. Hello I bought the Atari Flashback portable for my husband (He LOVED that game as a kid) I am trying to put it on an SD card so I can include that with the game for Christmas. I dont know what I am doing as I am not tech suave. Can you help? I followed your link and got a zip folder (???) is that what I transfer to the SD Card? Unzip the folder. You should have a “Game” folder. Copy the “Game” folder to the formatted SD card. Insert the SD card into your Portable, and it should work. Oh awesome! I’ll read in depth – thank you! I received mine in mid-December, and loaded up an old SD card with a few favorite ROMs while waiting for the unit to charge. Since then I have played it a few hours with a wide variety of games. + Emulation seems fairly decent. I’ve read some grumblings about the sound, and although it’s not perfect, I find it’s not bad, especially if you keep the volume relatively low. The cheap little speaker has significant distortion at high volume. + I found it very easy to get ROMs loaded into it via SD card. No problems there. + I tried some third party games such as Enduro, Donkey Kong, Frogger, etc. No problems there, either. – The D-pad was quite stiff at first, but loosened up after an hour or two of play. I think for games that require deliberate throws to the four cardinal directions it works OK. For games that need good diagonal input, such as Missile Command, the control is not so good. I am hoping that the D-pad will loosen up with a bit of usage. Paddle input is not emulated well with a simple D-pad, either. – One of the first games I tried was Berzerk, one of my top faves for the 2600. I found that although the game runs and you can move without issue, the fire button would not work unless you take a first shot at the left side of the screen. – The monochrome switch is not supposed to stay on, apparently. I found that if I hold it down, the screen is B&W, but as soon as I release, the Color setting returns. It did this with more than one game. Too bad, as I think there are a few games that are actually better in B&W than color. The unit is compatible with about 95% of all commercial ROMs. Overall I am very pleased with it. I’ve seen some complaints about various issues, but really I’m pretty happy with mine. For less $50, if it lasts for a while I’ll get my money’s worth out of it. How does this compare to the Atari Lynx (especially screen wise) and can it play Lynx games like Todd’s Adventures in Slime World? It’s nothing at all like the Lynx. It only runs Atari 2600 games. In terms of the screen, the original Lynx had a nice screen in its day, but, like all vintage LCD screens, it’s dreadful when used today. To modern eyes the Lynx screen is washed out with lots of motion blur (this is why lots of people, including me, get our vintage handhelds modded with modern screens that eliminate those issues). The Atari Flashback Portable has a modern screen of good quality. can anyone suggest an a/v cable that would work? 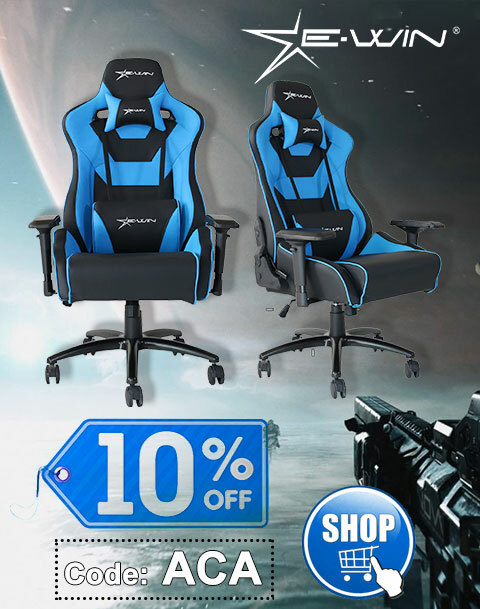 the atgames website is listing that as out of stock. anywhere else i should check? of another cable? the two prong connector -yellow @ white will only show main page and allow u thumb thru games-no playing no sound. if redwhite yellow needed where can i get one in localmarket? It sounds like you might have the wrong adapter type. Where did you get the AV cable?